Bring your family out and enjoy great live music, theatrical performances, nature talks and walks, river tours, and more. Great fun for children of all ages! 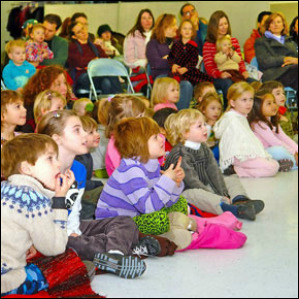 A lively show with lovable characters guaranteed to amuse children of all ages with constant surprises and clever twists. The Slime Booth concentrates on Polymers - long chains of molecules, like clay, putty, rubber bands, your skin and even the waistband of your underwear! Children will make and take home some Ooey Gooey Slime. Sponsored by Mad Science of West New Jersey. Enjoy special snow cone treats from our snow cone machine sponsored by James Maroldi, Realtor at River Valley Realty. When a troll drops the Mirror of Disenchantment it shatters into pieces which get blown around the world. A piece ends up in the eye of a young boy and the Snow Queen comes to take him back to her winter palace where she erases his memories of his family. Each show of the Snow Queen's Frozen Adventure is $8.00 and includes the Tucker Tales Puppet Show-Cirkus. 60 Bridge Street, Lambertville, NJ. FREE. Donations welcome. Home of the Lambertville Historical Society, tour the period rooms and local history exhibits of this 1816 boyhood home of the discoverer of Gold in California. For more information, call 609-397-0770 or visit www.lambertvillehistoricalsociety.org. Walking Tour of Historic New Hope featuring structures built prior to 1800. Dress for the weather and be sure to wear comfortable shoes for this, your easy 1 1/4 hour tour. Meet at Parry Mansion, 45 South Main Street, New Hope, PA. Sponsored by the New Hope Historical Society. For more information, call (215) 862-5652 or visit:www.newhopehs.org. Join us for a historical tour through Lambertville. Tours start at the Lambertville Station, 11 Bridge St., Lambertville, NJ. FREE, Donations welcome. Sponsored by the Lambertville Historical Society. For more information, call 609-397-0770 or visit www.lambertvillehistoricalsociety.org. 60 Bridge Street, Lambertville, NJ. FREE. Donations welcome. Home of the Lambertville Historical Society, tour the period rooms and local history exhibits of this 1814 boyhood home of the discoverer of Gold in California. For more information, call 609-397-0770 or visit www.lambertvillehistoricalsociety.org. Meet at the railroad caboose behind the Lambertville Station restaurant, 11 Bridge Street, Lambertville, NJ. Explore two historic canals and cross over the Delaware River on this scenic and informative 2-mile, guided walking tour.See the lift lock and the outlet lock on New Jersey’s D&R Canal and learn how canal boats crossed the river from New Hope to Lambertville. Enjoy the river vistas while crossing the bridge to Pennsylvania, and then follow the Delaware Canal towpath south to Lock 11 and its Locktender’s House where hot chocolate and cookies will be waiting. Sponsored by the Friends of the Delaware Canal and the D&R Canal Watch. Donations appreciated.